The festival of lights is just here, knocking at your door. So, why not welcome and celebrate it by throwing a party? Hosting a Diwali party implies arrangements and outlays. Whether you aim to have a grand celebration or an intimate gathering, you need to set a budget for every arrangement. Allocate a certain amount of money beforehand for décor, food, music and other essentials and don’t get carried away with anything that exceeds your budget. Sticking to your budget, hence, is very important while planning a party. When you fix a budget and stick to it, it gets easier to organize a party without regretting and outdoing a specific amount. A party is lifeless without loved ones. So, while preparing a guest list, don’t forget your favorite people and close friends. However, don’t include those people who you think would give an excuse and wouldn’t show up. Hence, exclude such people and include only those individuals who care, enjoy and are upbeat. While making a guest list is tiresome, inviting your intimate circle of friends and family won’t give any headache. Don’t go overboard while inviting guests. Instead, use email or a messaging app to invite your guests. Also, make sure they acknowledge the invitation and confirm their presence. While your menu should be simple and sensational, you must include a variety of finger foods, starters, main course, and other hot & cold varieties. However, make sure that the foods you offer to partygoers aren’t oily because the greasy stuff will make their hands dirty and it would be bothersome for them. Also, if your main course includes filling dishes, make sure that you serve your guests low-calories starters. Golgappa shots, skewered kebabs, nachos, tarts, would be the ideal starters for your guests. You can stock up some frozen foods too to include in your menu. While the snacks should be easy to gobble up, don’t forget to serve Jalebi, Laddu, Pera, and other sweetmeats to your guests. Diwali is a festival of lights. This means you must light up the venue to create an aura of this auspicious occasion. Decorate your walls and curtains with LED lights. 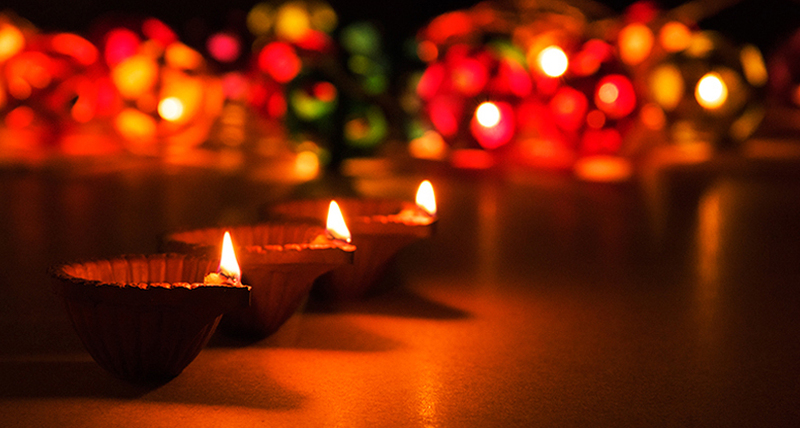 Get diyas and fairy lights to light up your house. Lanterns would further add beauty to your party and enrich the ambiance. A ‘nay’ for Diwali party is decorating your house with balloons. Instead, use lanterns and lights to give your modern party a traditional and minimalist look. Since one part of Diwali is the spirit of giving, you must give your guests a surprise at the end of the celebrations. Hence, make sure that they return home with a box of cookies or chocolates. While the party favors would bring a broad smile on their faces, this gesture would make your party unforgettable for them. Diwali implies laughter, delicious food, music, games and jubilation and throwing a party would be a great idea to enjoy everything to the fullest with your loved ones. You can also hire our party planners who would jazz up your bash with their services and ideas. Glamorous Event Planners wishes everyone a Happy and Fun-Packed Diwali!